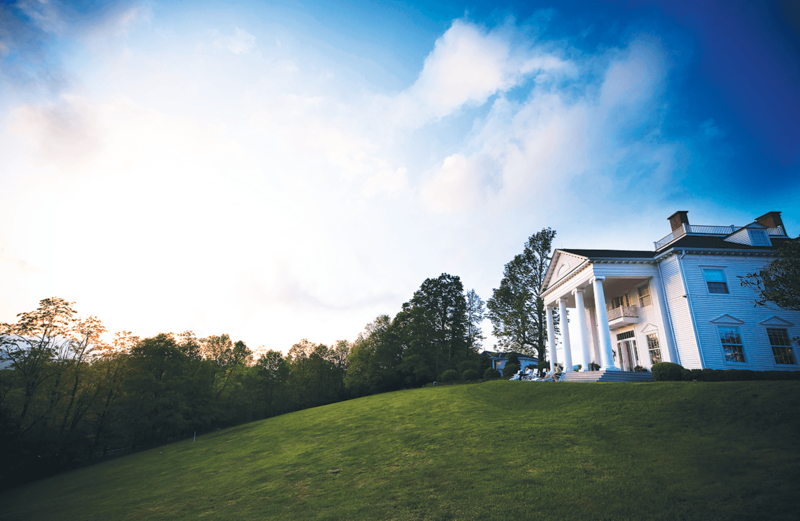 Built a century ago by an artist captivated by the light created when the sun set behind Grandfather Mountain, Westglow Resort & Spa in Blowing Rock now draws visitors in search of solitude and luxury. 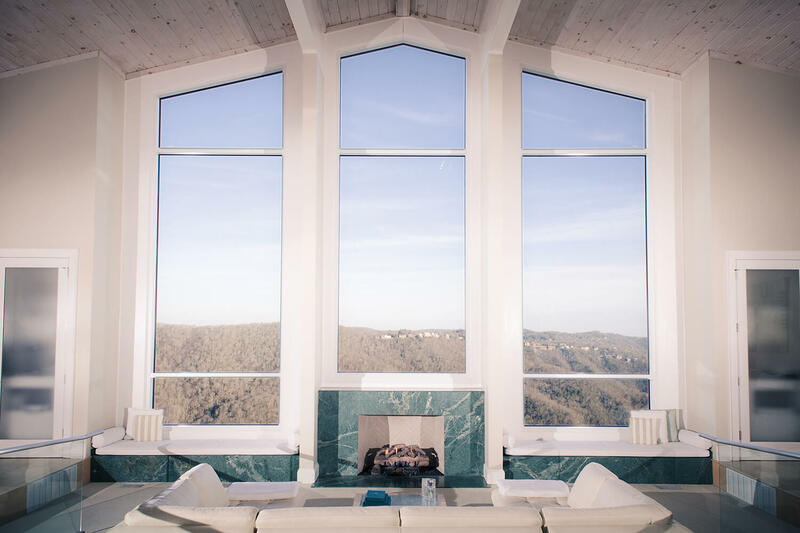 The relaxation lounge at Westglow Resort & Spa feels like a church: white, cushiony chairs face a triptych of floor-to-ceiling windows that point toward the sky. But the sky doesn’t need any help being noticed — brilliant blue fills each of the three panes and floods the room with sunshine, immediately noticeable, immediately breathtaking. Looking out across the densely forested valleys, the indigo layers of the Blue Ridge Mountains stretch along the horizon. A white couch loaded with thick white blankets sits in front of a marble fireplace. Everything here seems to be white, pure. It’s no wonder, then, that this, too, would be the place where Glynda Valentine chose to open a spa in 1991, where the setting contributes to Westglow’s mission of healing and restoration. A place where that “slumberous air,” that glow descending upon the trees, is what people come for, and what they leave remembering. “Being surrounded by such vast beauty nurtures the soul,” says Bonnie Schaefer, who has owned Westglow with her partner, Jamie, since 2005. Buying a historic landmark as a summer home may seem extravagant, but Bonnie comes from a wealthy family. Her father had owned Claire’s, the ear-piercing mecca and large chain of mall jewelry stores; Bonnie became its co-CEO with her sister after their father suffered a stroke in 2002. After purchasing Westglow, Bonnie and Jamie restored the property to its onetime splendor, and made it livable year-round. They also expanded the Life Enrichment Center, added the relaxation lounge, reimagined the gourmet menu at the spa’s Rowland’s Restaurant (named after Bonnie’s father), and eventually attained the prestigious Relais & Châteaux designation. “We provide a sanctuary for those seeking wellness of the mind, body, and spirit, and as a place to revitalize and recharge,” Jamie says. Mothers and daughters retreat to Westglow to bond; so do groups of girlfriends; so do couples. One client attends a session with a wellness coach who inspires her to set goals and dig deep for new ideas, leading her to make a significant career change. Another client finds rest and relaxation in hiking after the death of her husband. Two women discuss tragedies in the spa’s locker room, and their self-destructive attempts at coping; they discuss the raw parts of their lives as they dry their hair, speaking with the intimacy of lifelong friends, until, It was great to meet you, one says to the other as she slips on her shoes. I hope I’ll see you at yoga later. People find each other here; they find themselves. Smith walks briskly, pointing out landmarks from the trail, discussing the particular changes in the season, the condition of the clouds in the sky. She weaves in stories of her grandson, of bears that’ve crossed her path, and of celebrities who’ve visited Westglow. She asks questions of the hikers, and by the time the group reaches the hike’s destination, everyone knows one another a bit better. Everyone feels a little closer. The lookout tower is one of her favorite hikes, an hour and a half uphill, with beautiful views along the way. Smith encourages hikers to climb the tower, once used for spotting forest fires. An agonizing climb up flights of steps leads to 360 degrees of unimpeded views of the Blue Ridge Mountains, with Grandfather Mountain presiding over it all. On the way back down, she points out Westglow from the trail, a distant white pebble tucked into the trees, a welcome touchstone in the wilderness. Iza Wojciechowska is a writer and translator living in Durham, NC. She has an MFA from Columbia with concentrations in creative nonfiction and literary translation.